Bring your own drinking water, as potable water is not available in the park. Buse Lake is a favourite location for birders and naturalists. The lake is known for shorebirds, with some relatively rare species such as American avocets, which are attracted to the rich alkaline shoreline. The top of Buse Hill offers expansive views of surrounding landscapes of the Thompson Basin. The hike to the top of the hill from the south is relatively short and easy. The north facing terrain above Buse Lake rises steeply through forested slopes to a high cliff face, topped by rocky summits. The 200 meter high cliff formations include a impressive detached rock tower. The steeply sloping terrain on the south side of the park drops down into upper grassland habits on adjacent grazing lease lands. Local rockhound enthusiasts have collected blue opal from the area immediately adjacent to the park, lying southwest of Buse Lake. While most of the rock hounding activity occurs outside of the park, there is some interest in using the park. Rock hounding activities in the park are confined to low impact rock chipping and surface collecting. The Park exhibits some of the diversity of rock types found in the Robbins Range, which originate from Cenozoic (Upper Triassic), Mesozoic and Paleozoic eras. The lower portions are comprised of volcanics and the upper slopes are a complex array of basalts, breccia, schists and conglomerates. Buse Lake Park is located approximately 20 km southeast of Kamloops on the old Vernon Highway. The closest community, town or city is Kamloops. History: This park was established as part of the Kamloops LRMP in January 2001. Cultural Heritage: First Nations use of the area is unknown, although it is likely that some hunting and food gathering activities occurred. There are no recorded archaeological sites or features in the park. Conservation: The unique water chemistry and high alkalinity of Buse Lake creates special habitat conditions for brine flies, and other aquatic insects and plants that are adapted to salt rich environments. The lake and marl edges attract a variety of waterfowl and shorebirds. The park lies totally within the Thompson Basin Ecosection and provides a small representative elevational gradient through the PPxh2 and IDFxh2 subzone/variants biogeoclimatic zones. The lower portion is mostly grassland with some open ponderosa pine and Douglas fir forests representative of the PPxh2 subzone/variant. The mid to upper regions are covered primarily by climax stands of Douglas fir and old Ponderosa Pines with sparse understory of common snowberry, saskatoon and birch-leafed spirea, representing the IDFxh2 subzone/variant. These subzone/variants are reasonably well represented in other parks within this ecosection and in other ecosections. The north facing terrain above Buse Lake rises steeply through forested slopes to a high cliff face, topped by rocky summits. 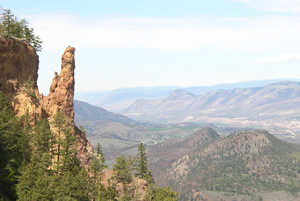 The 200 metre high cliff formations include an impressive detached rock tower. The steeply sloping terrain on the south side of the park drops down into upper grassland habits on adjacent grazing lease lands. The Park exhibits some of the diversity of rock types found in the Robbins Range, which originate from Cenozoic (Upper Triassic), Mesozoic and Paleozoic eras. The lower portions are comprised of volcanics and the upper slopes are a complex array of basalts, breccia, schists and conglomerates. Approved Management Direction Statement for Buse Lake Protected Area, [PDF 396.53 KB] is available online in pdf format. The top of Buse Hill offers expansive views of surrounding landscapes of the Thompson Basin. The hike to the top of the hill from the south is relatively short and easy. For your own safety and the preservation of the park, obey posted signs and keep to designated trails. Shortcutting trails destroys plant life and soil structure. This park is open to hunting. Please refer to the Hunting and Trapping regulations for more information. Buse Lake is a favorite location for birders and naturalists. The lake is known for shorebirds, with some relatively rare species such as American avocets, which are attracted to the rich alkaline shoreline. The top of Buse Hill offers expansive views of surrounding landscapes of the Thompson Basin. The hike to the top of the hill from the south is relatively short and easy.